I have a few rules about my book-buying and book-reading habits. This is a post about a couple of them. 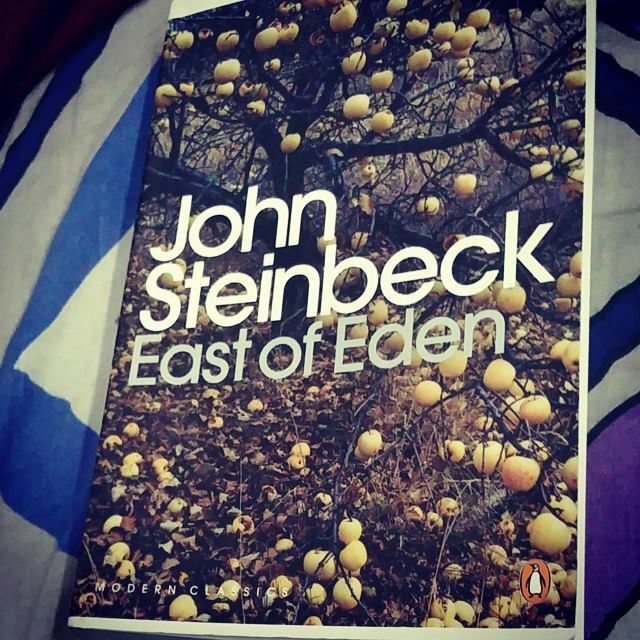 Also, this post is a prelude to the book review of the book East of Eden by John Steinbeck. Think of it as a teaser preview. It started off as the book review itself but the customary rambling at the start of the post got alarmingly long and I decided to post it separately so that people interested in just the book review don’t fall asleep or kill themselves or set a hitman (hitperson? :P) on me or cast a voodoo spell on me. Anyway, I had heard from some that this book is his best work, and I really wanted to read it. One Youtuber whose taste I worship said this was her favourite book of all time, making me really eager to read it. I then found this insanely pretty edition of it and I knew then that it was meant to be. Now, I generally have a rule that I won’t buy more than one book of a new author’s because it’s too much of a risk. What if I abhor their writing? What if the books just don’t sustain my interest? It seems extraordinarily foolish to end up stuck with more than one dull book by the same person. However, I broke this rule twice in the last few months out of compulsion, more than anything else. Let me explain. Most of my books live at home and I can’t cart lots of books to college because of luggage weight limits on planes. However, that doesn’t stop me from going on major shopping sprees each time I am at home. I then leave most of the books at home, unread, because I only go home for short durations and, as I mentioned earlier, I barely read when I’m at home because I have a social life at home. I have a social life in college, too, but most of my friends here are geeky introverted, internet-addicts like me and they also live within a few feet of me. Also, I intern in my vacations which is far more time-consuming than college. Anyway, I broke this rule for the first time after I bought Half of a Yellow Sun by Chimamanda Ngozi Adichie when I was at home, came back to college, and found Americanah in the bookstore. The synopsis at the back of the book charmed me and I just knew I had to read it. So I did. And I adored it. I remember saying as much in a review. I now can’t wait to go home and do a little marathon of Half of a Yellow Sun, Beloved by Toni Morrison, and A Colour Purple by Alice Walker, all of which I own and haven’t read yet. And then I’ll probably buy Purple Hibiscus by Adichie, and also maybe every single other thing by Toni Morrison, or maybe something by Zora Neale Hurston, so you guys can look forward to that. Back to my original(ish) point, however. The other time I bought a second book by the same author without reading the one I already owned, if you guys hadn’t guessed by how the post started, is with East of Eden. This entry was posted in Books, Life and other stupidities, Reading Habits on March 1, 2015 by Sin.